On Saturday, April 25th, we were in residence at the Malden Bridge Community Center Appraisal Day event. The event is similar to the Antiques Roadshow: individuals bring in their family treasures for appraisers to evaluate, looking for information and hoping for a pleasant surprise. We had a great time at the event, meeting lots of people and seeing some really interesting things. This week we’ll be taking a closer look at some of the highlights from the day. 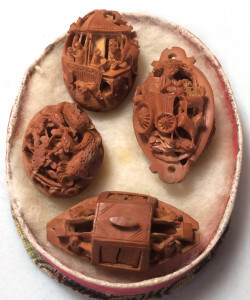 This small box held one of the tiniest surprises of the day: four intricately carved peach pits from China. Carving fruit and walnut pits has been an admired form of folk art in China for centuries. 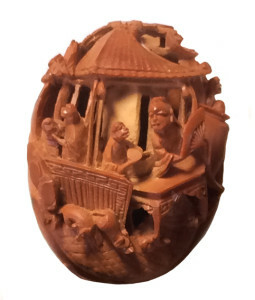 The art of fruit pit carvings is called Heidao (“nut carving”). It may have began from the Chinese belief that the peach symbolized life and longevity, or may be because “peach” is pronounced the same as the word for “escape”. The origins are mysterious, but using or wearing peach pits to ward off evil and avoid misfortune was a firmly established tradition that likely evolved into this art form. While Heidao means “nut carving”, the art form has primarily used peach stones. The art of nut carving gained popularity over 700 years ago, during the Song Dynasty (960-1279). By the Ming Dynasty (1368-1644), the intricate miniature sculptures had become one of the most appreciated art forms as well as a fashionable accessory. Even the emperor himself owned several decorative pieces by master artisans. Each peach stone is unique, with an irregular shape covered in bumps and holes. A master carver was capable of producing an exquisite three-dimensional sculpture on a very tiny scale. The finest master carvers could create complex historical scenes, poetic themes, overflowing flower baskets, rustic landscapes, on a peach stone usually measuring somewhere between 3/4″ to 1 3/4″ long. Each tiny work of art was an incredible feat of creative vision, technical skill, and patience. 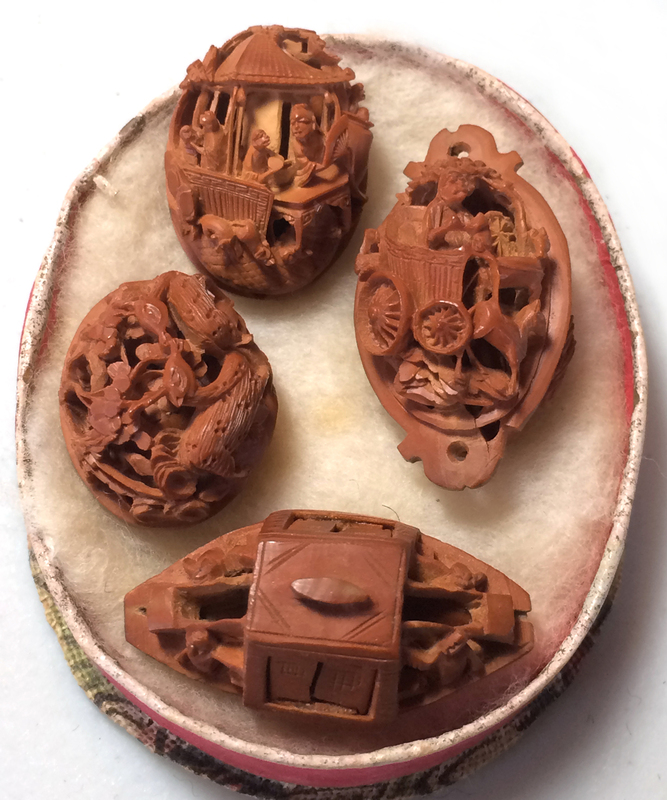 The carved peach pits brought to Saturday’s Appraisal Event probably date to the 19th century. Each has a unique design, miniature in scale and finely detailed in technique: a fishing boat, a person driving a wagon, a city market scene filled with merchants and customers, and an intricate landscape arrangement of flowers, leaves, and vines. These fruit pit carvings are a really nice example of how this traditional folk art has persevered for centuries. Mark, Thank you for your evaluation of my article. Your time and patience was greatly appreciated. It was a pleasure doing business with you. I'll be back. - Jane K., Gansevoort, N.Y.